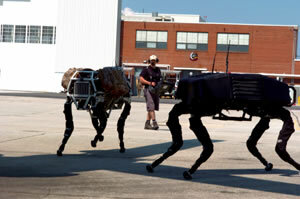 BigDog, the robotic quadruped robot from BostonDynamics, is starting to run in packs. Take a look at this photo shot with the MCAS New River unit. In what Military.com described as "a demonstration reminiscent of a new age science-fiction flick," BigDog trotted down the ramp of an MV-22 Osprey aircraft. The robot runs at a rate of 3.3 miles per hour, can climb a 35 degree slope and can carry a 120 pound load. According to DARPA program manager John Main, "“BigDog is going to someday, hopefully, give us the ability to have a mechanical mule to follow us around in the field and carry a couple hundred pounds of supplies". BigDog's legs are articulated like an animal's; it has compliant elements that absorb shock and recycle energy from one step to the next. Its onboard computer controls locomotion and a variety of sensors. To find out more about the BigDog robot, read BigDog Quadruped Robot Update. Thanks to an anonymous reader for pointing this photo out; your contributions are always appreciated - just contact us.